This article examines the recent Court of Appeal judgment in Obnet Sdn Bhd v Telekom Malaysia Berhad (7 September 2018, Civil Appeal No. 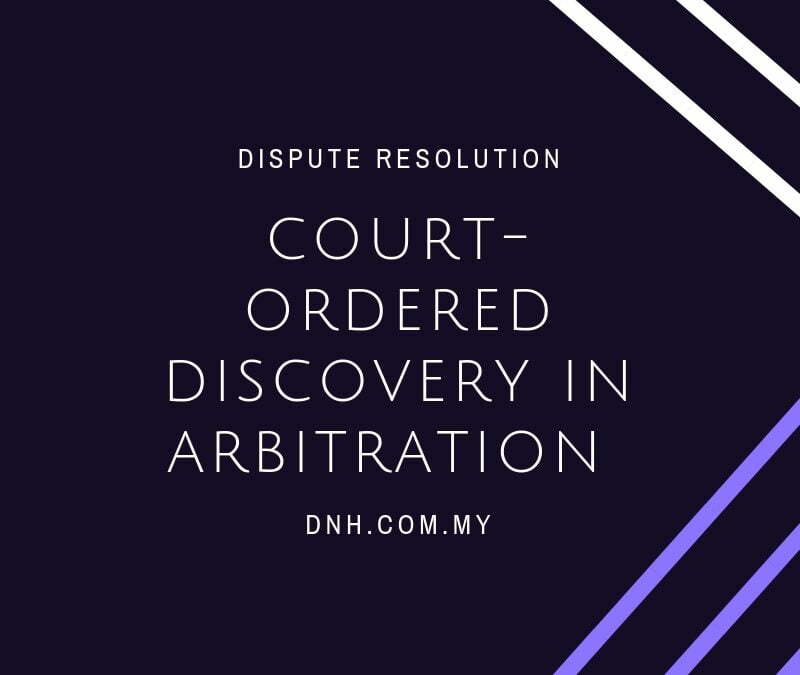 W-02(NCC)(A)-1698-08/2017) which dealt with the issue of a party applying to the High Court for discovery, in aid of a pending arbitration proceeding. Obnet Sdn Bhd (“Obnet“) was appointed by the Selangor State Government to provide high speed broadband network to various government departments and statutory bodies of the State Government (“SELNET Project”), pursuant to an agreement known as the SELNET Agreement. Pursuant to a Services Agreement, Obnet appointed Telekom Malaysia Berhad (“TM”) to design and build the network infrastructure for the SELNET Project. In July 2013, Obnet commenced arbitration proceedings against TM for breach of the Services Agreement. In the course of the arbitration proceedings, TM sought discovery of the Settlement Agreement to determine whether Obnet had already been compensated for their claims. The application for discovery was refused by the arbitrator, on the grounds that (among others), the State Government would be prejudiced by the disclosure. TM thereafter applied to the High Court under the then Section 11(1)(b) of the Arbitration Act 2005 (“Act”), for an order for discovery of the Settlement Agreement. The High Court ordered discovery of the Settlement Agreement. Obnet appealed to the Court of Appeal. While the Consent Judgment and the Settlement Agreement provided that the terms of the Settlement Agreement were to be kept confidential, this does not mean that the Court cannot order disclosure. That being said, the Court of Appeal was concerned that the State Government, who was a party to the Settlement Agreement, was not made a respondent to the discovery application and was therefore prejudiced by the discovery order. The application for discovery was made under the then Section 11(1)(b) of the Act. Section 11(2) of the Act provides that where the arbitral tribunal has already ruled on any matter which is relevant to the application, the High Court shall treat any findings of fact by the arbitral tribunal as conclusive for the purpose of the application. As such, the High Court was bound by the arbitrator’s earlier finding that the disclosure would be prejudicial to the State Government. Whatever the merits of such a finding, the High Court has no jurisdiction to interfere. The High Court ordered the discovery of the Settlement Agreement as it was of the view that the Settlement Agreement was necessary or relevant to the arbitration proceedings. The Court of Appeal held that this was an issue best left to the arbitral tribunal, lest the Court be accused of usurping the arbitral process. In any event, the Court of Appeal held that, even if the Settlement Agreement were relevant, any information sought to be uncovered from the Settlement Agreement (eg: whether Obnet was compensated by the State Government) can be obtained through the examination of witnesses in the arbitration proceedings, without the need to reveal the whole of the Settlement Agreement. If the witnesses refuse to testify, then TM would be at liberty to seek the from the arbitrator an order to look at the documents and disclosure can be ordered with the appropriate safeguards. A discovery order by the Court was therefore unnecessary. The removal of “discovery” from amended Section 11 appears to be in line with the position that Section 11 is only meant to address “interim” relief that supports the arbitral process. An order for production and discovery is more of a “permanent” relief and this something that should be within the domain of the arbitral tribunal. Regardless, the Court of Appeal’s judgment is consistent with the general policy approach of having minimal court intervention in arbitration proceedings. In keeping with this policy, the Court of Appeal has interpreted the then Section 11 of the Act as intending to support the arbitral process, and not to exercise some kind of supervisory role over the arbitration proceedings. The Court of Appeal acknowledged that some arbitrators may not be legally trained and therefore some flexibility to procedural matters ought to be adopted, and Section 11 applications should support and facilitate the arbitral process and not displace it. Case Spotlight: Federal Court Rules on Definition of "International Arbitration"